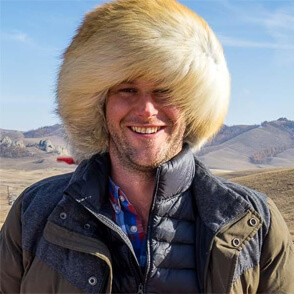 Like many of the travellers who are discovering Kyrgyzstan as a destination, I’ve come here for the nature. The rows of mountains like turret-topped walls; the shimmering gems of lakes amongst them; the colourful fields of flowers beneath them; and the hint of dusty deserts on the edges. It’s the exploration of the vast textures in the landscapes that make the country so exciting. 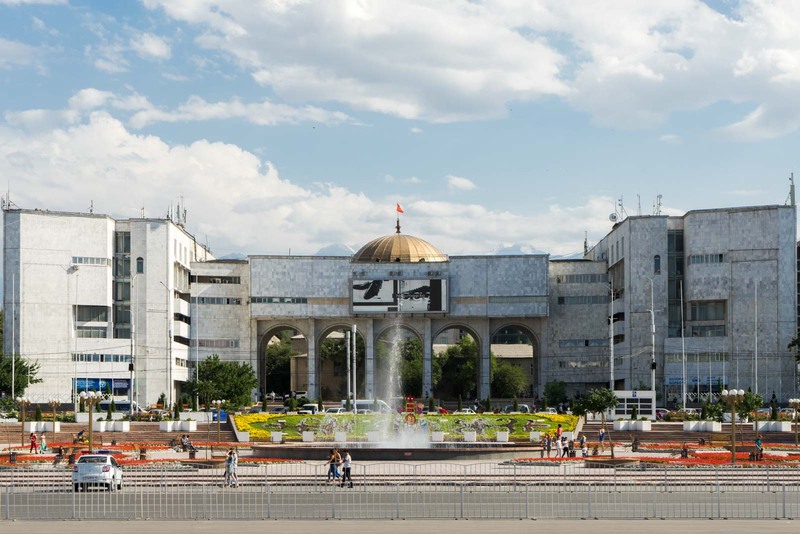 But most people will arrive by plane in the capital Bishkek and I think it’s silly to not spend at least a day seeing what’s on offer before heading further afield. 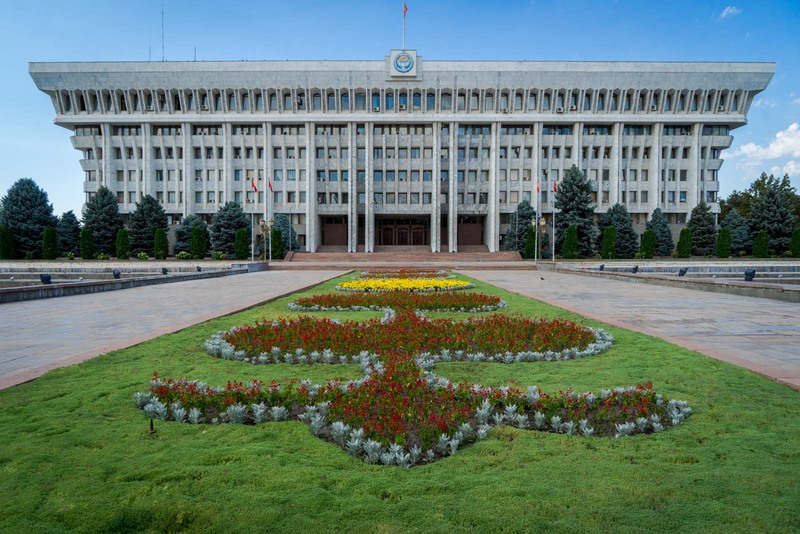 Bishkek is an interesting city and one that, by all accounts, is filled with a vibrant way of life for residents. For tourists, though, it doesn’t have a huge amount of famous sites to visit. 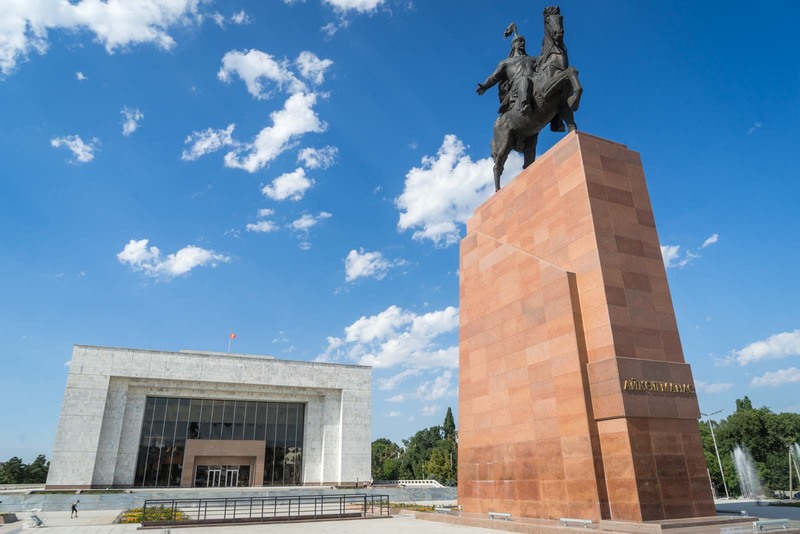 In the centre of the city, though, you’ll quickly notice that the streets are lined with architecture that offers a way to explore Bishkek through its modern history. 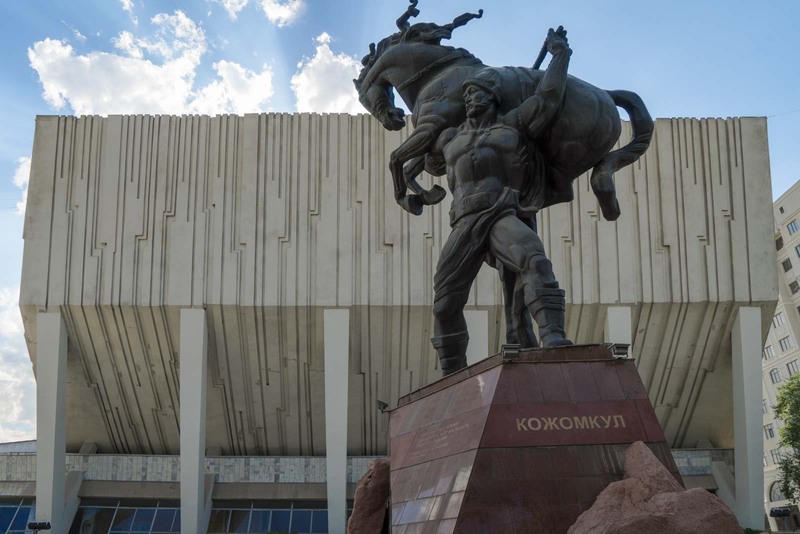 As a former member of the USSR, Kyrgyzstan’s capital is full of intriguing Soviet-style buildings that can be used as a roadmap for discovery. 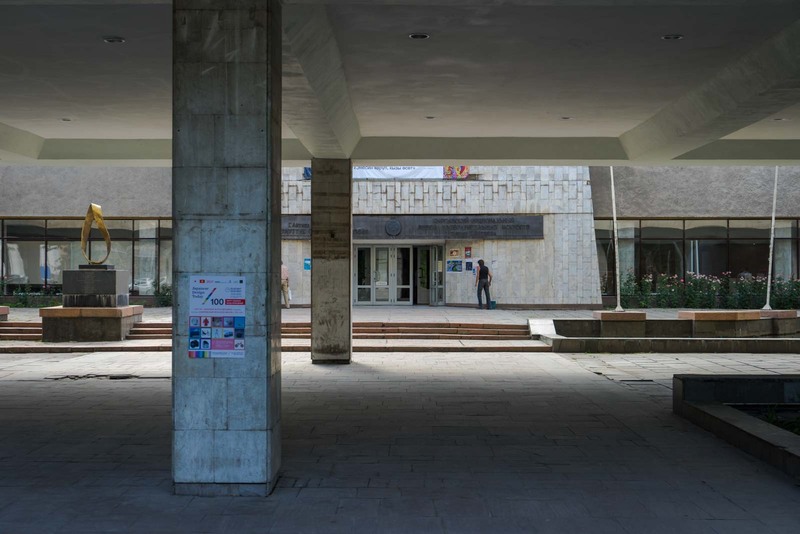 What I thought I would do is put together a guide for a short walking tour through the centre of Bishkek that will let you see (and stop at) some of the highlights of the collection of Soviet architecture on offer. 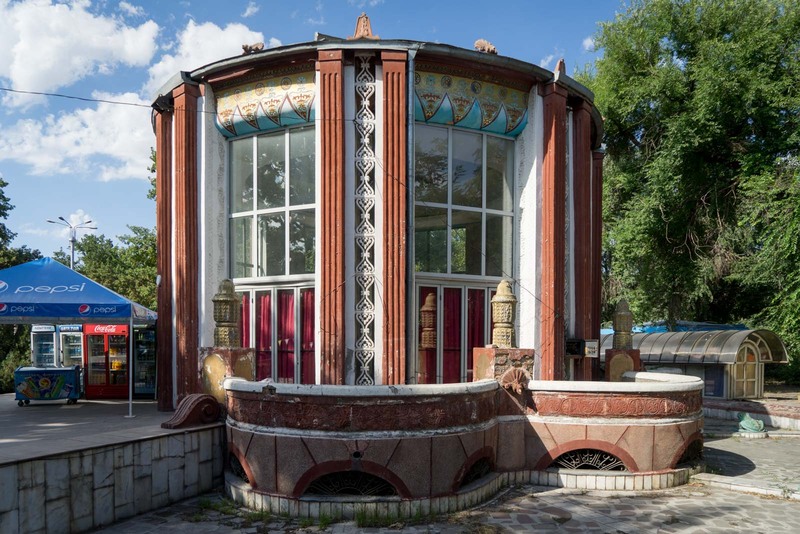 Even though it’s been more than 25 years since Kyrgyzstan became independent after the fall of the Soviet Union, these buildings remain and have been incorporated into modern culture and politics. Not surprising, of course. Just because the governance changes, it doesn’t mean the public’s idea of style and design does. And so, with this architecture, we can get a sense of the slow evolution of the country over the previous few decades. If you would like to do this walking tour yourself, you can use this map I’ve put together. Open it up on your phone and you’ll even be able to follow along as you walk. The actual walking will take about an hour, plus about another hour to stop and look at the locations. So, if you’re ready, let’s start the tour at Victory Square. 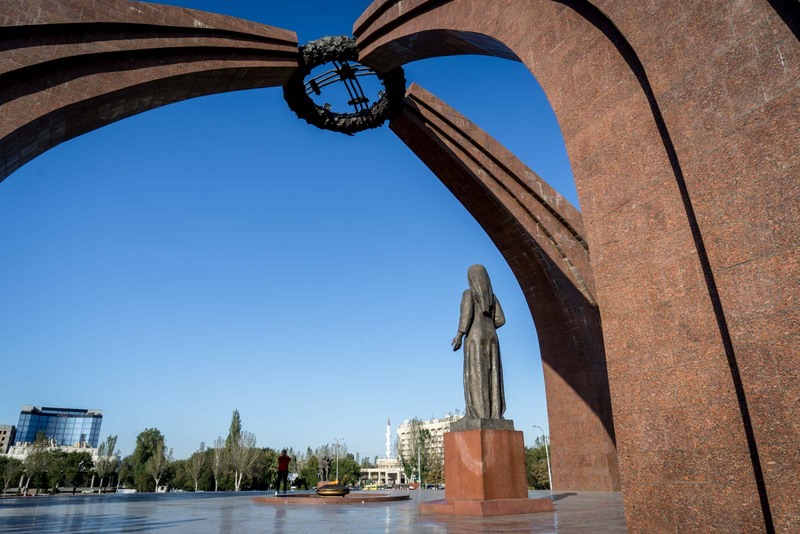 In the middle of Victory Square is the enormous Monument of Victory, the shape of which represents a yurt, with which a sculpture of a mother with a cup waiting for her husband and sons to return from war. The monument was erected in 1985 on the 40th anniversary of the Soviet victory in the ‘Great Patriotic War’, which is a term the USSR used to describe the part of World War II that it was involved in. 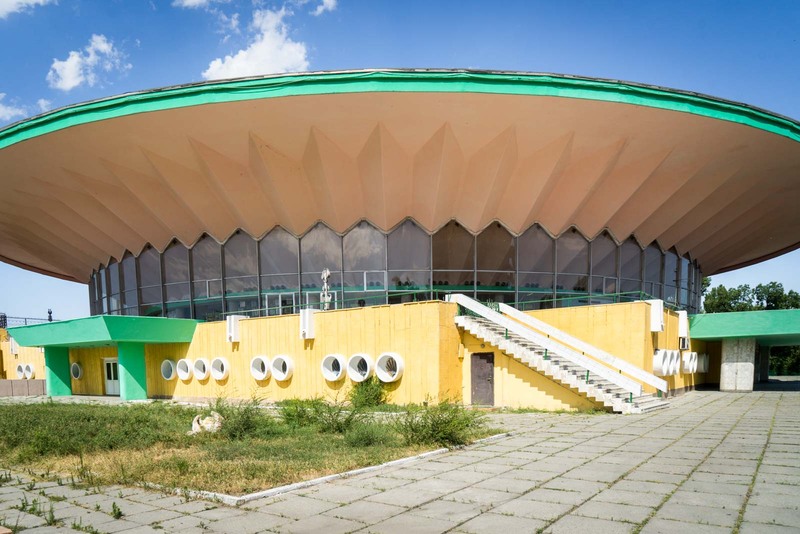 The Circus is what you may expect – it’s the building where the circus is held in Bishkek. The performances here still involve animals but you could try and get a ticket if there’s something on when you’re in town. I love the shape of the building, which was constructed in 1976. It looks a bit like a UFO or something slightly unworldly. The nearby Wedding Palace is a fascinating site. During Soviet times, religion was strongly discouraged so people couldn’t get married in a church or synagogue or mosque. To appease the public, the rulers opened the Wedding Palace as an interfaith location to conduct weddings. It was built in 1987 and is still used today for weddings. You should be able to walk in and have a look around and take some photos. You won’t be allowed into the central elevated area where the ceremonies take place. 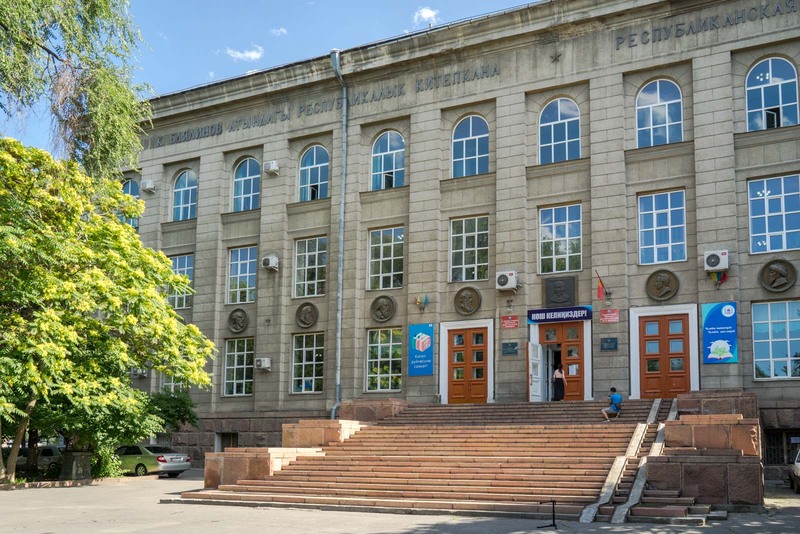 Although the official Library of Kyrgyzstan was founded in 1934, the building that now houses the collection is from 1983. Inside there are apparently more than 6 million items. You can go into the foyer and have a look around. 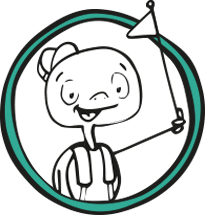 To get further into the library, you will need to do what everyone else does and buy a day access pass. It is only 5 som (about US$0.07) so don’t be scared to do it, if you’re interested. The the building for the Museum of Fine Arts was built in 1974 and it’s certainly artistic, although I’m not so sure I would call it ‘fine’. It’s a great example of the architecture of the time, though. 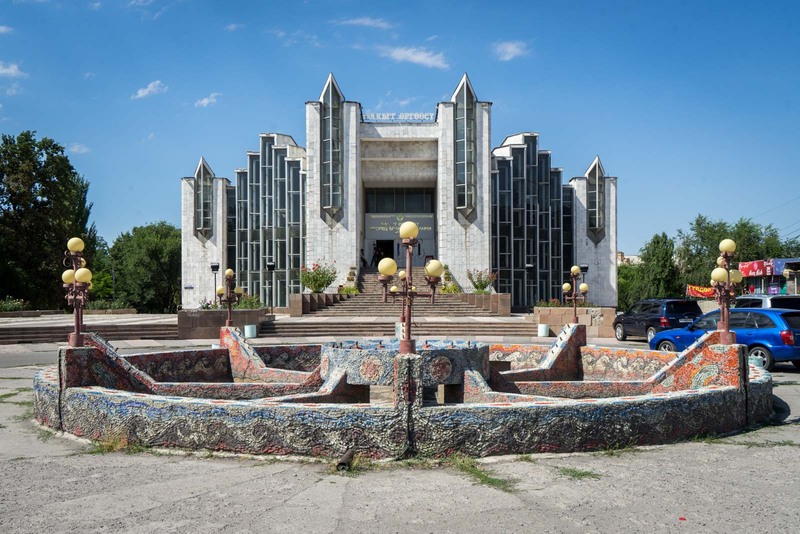 You can visit the museum and see the collection if you have an interest in the artistic or cultural side of Kyrgyzstan. A ticket for an adult is 40 som (US$0.60). 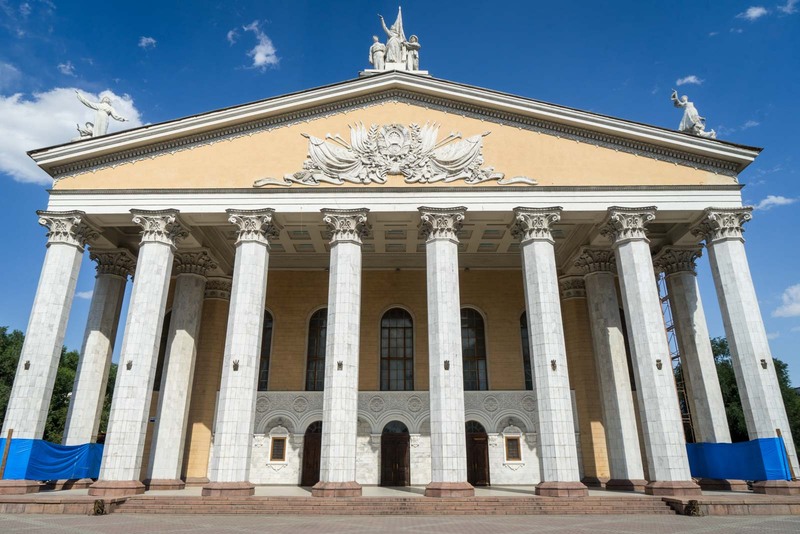 The Opera and Ballet Theatre may seem a bit out of place with its Neoclassical design but I’ve come to accept that not everything makes sense when it comes to Bishkek’s architecture. Still, it’s an impressive building that was opened in 1955. The doors are normally shut but if there’s a performance on, you may be able to pop inside and have a quick look at the foyer. Tickets to a performance aren’t much, ranging from 100 som (US$1.50) to 450 som (US$6.50), so that’s another way to get inside! 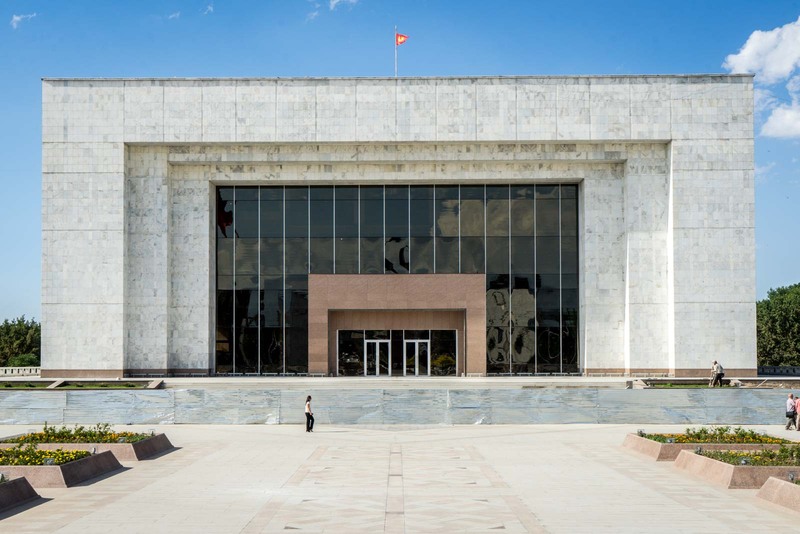 Although the National Library is much more important and gets most the attention from visitors, the Republican Library for Children and Youth is actually more popular with the locals. You’ll go straight past it on this tour but there’s probably not much need to pop inside. Even though it may look a bit plain from the outside (just concrete and glass), I think this theatre actually has some quite cool architectural elements inside. You should be able to wander in and have a look around if the front doors are open. 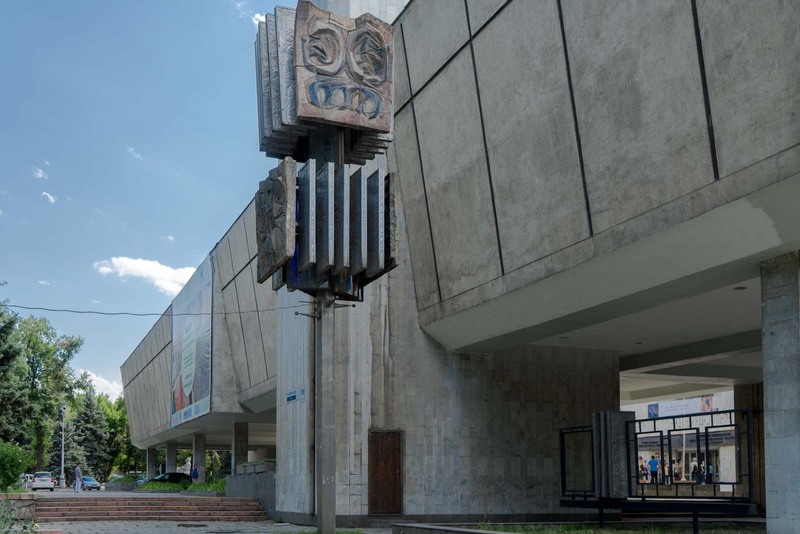 It was built in 1972 and is in the process of having a renovation. It may be closed sometimes for construction work – and I’m not sure exactly how it is going to look when it’s all finished. 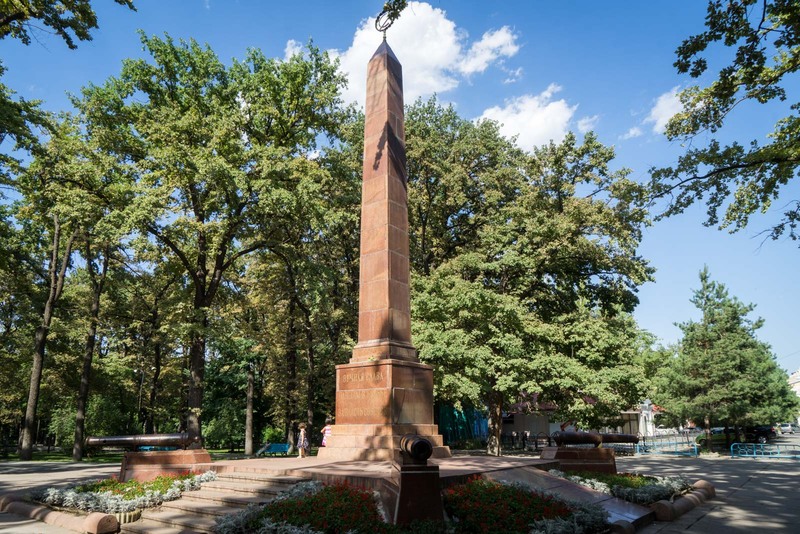 Opposite the Russian Drama Theatre is the Memorial to the Red Guards, marked by a large obelisk. 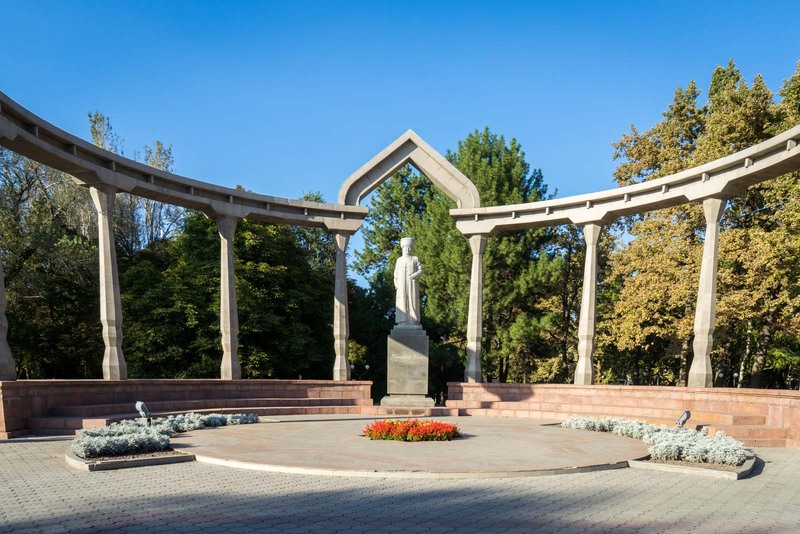 The monument was unveiled in 1957 and is dedicated to the Red Guards who died during the ‘Great Patriotic War’. Further along in Oak Park, you’ll find the statue dedicated to Kurmanjan Datka. This was actually erected in 2004 – well after the Soviet era – but I’m mentioning it for a few reasons. Firstly, you will walk right past this large monument and probably wonder what it is. Secondly, she was a very important historical figure who ruled over much of Kyrgyzstan in the 1800s. And thirdly, this is the site where other important statues have stood in the past, including one of Lenin from 1948 – 1984. Before you leave the park, pop into this little shop on the edge. 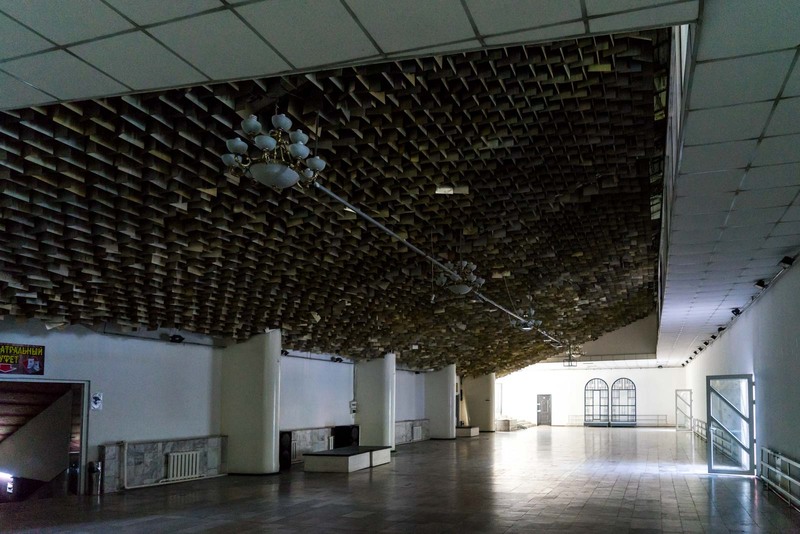 You’ll spot the interesting architecture – and it has an interesting story as well. It used to sell soda during the Soviet era. Rather than knock it down or turn it into something more modern, it is still used as a little shop to sell drinks and snacks. 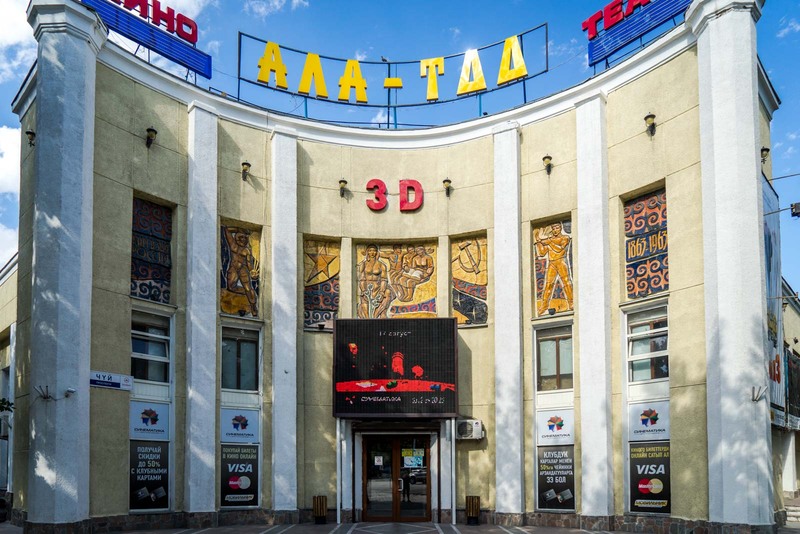 This cinema is still very much in use and is one of the largest and most popular in Bishkek. But the facade is fantastic and I love the artwork above the doors. The mosaics are of Soviet cosmonauts and other heroes. 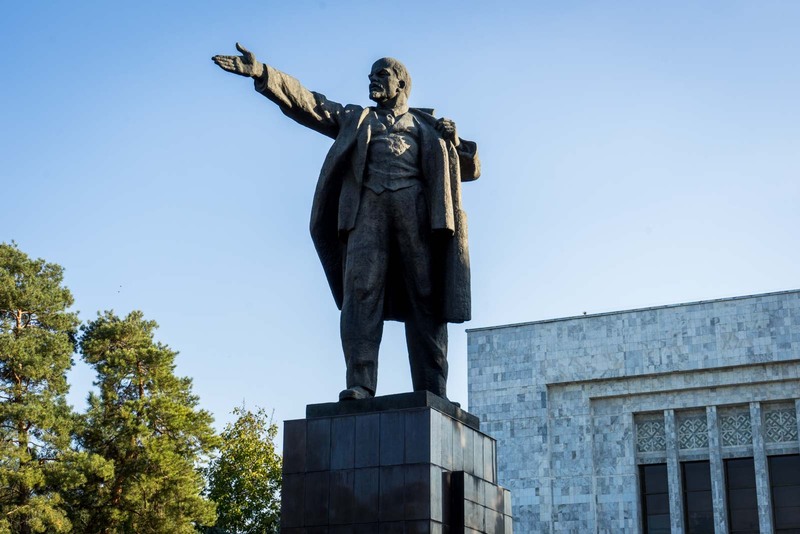 This statue of Lenin is the one that used to stand on the site where the monument to Kurmanjan Datka now is. It was originally put up in 1948 on top of an obelisk and the whole thing was 13 metres tall. It was first taken down in 1984 (before the USSR fell) because a much larger one was being installed elsewhere. This one was given a spot in the gardens behind the State History Museum in 2003. 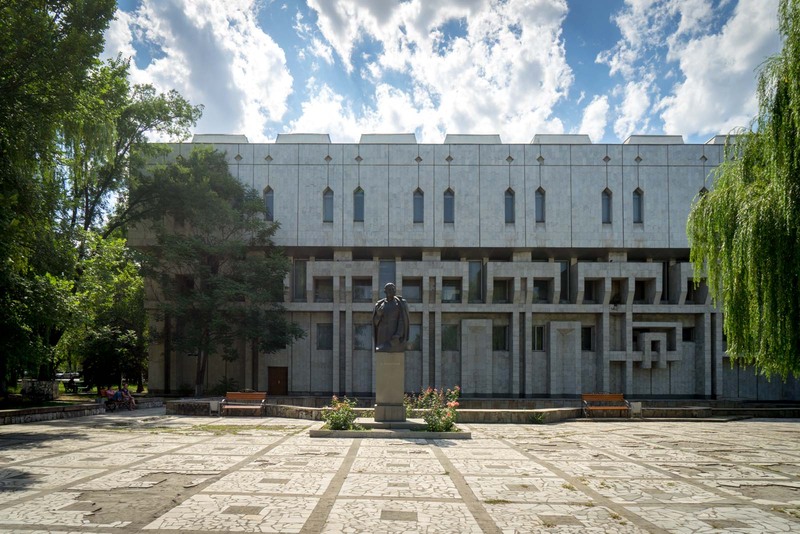 This is one of the most important buildings in Bishkek and no architecture tour of the city is complete without it. The State History Museum was built in 1984 and it looks like a big marble cube. The fountains and square in front flow into the design. At the moment, there is construction work going on so you can’t go inside or get too close. Hopefully it will be open again soon (please let me know in the comments if you hear any news). The Manas Statue right in from of the State History Museum is another site that I’m including in this tour but is not technically Soviet. In fact, it was erected in 2011 to celebrate the 20th anniversary of independence from the USSR. It is just over 17 metres tall and has a statue of the legendary Manas, a figure who is extremely important in the folklore of Kyrgyzstan. On the other side of the main road are the large government buildings with a structure that looks like a yurt in the middle. Although you can see them from the Manas Statue, I would recommend crossing over and having a closer look at the area before you come back over and continue the walking tour. 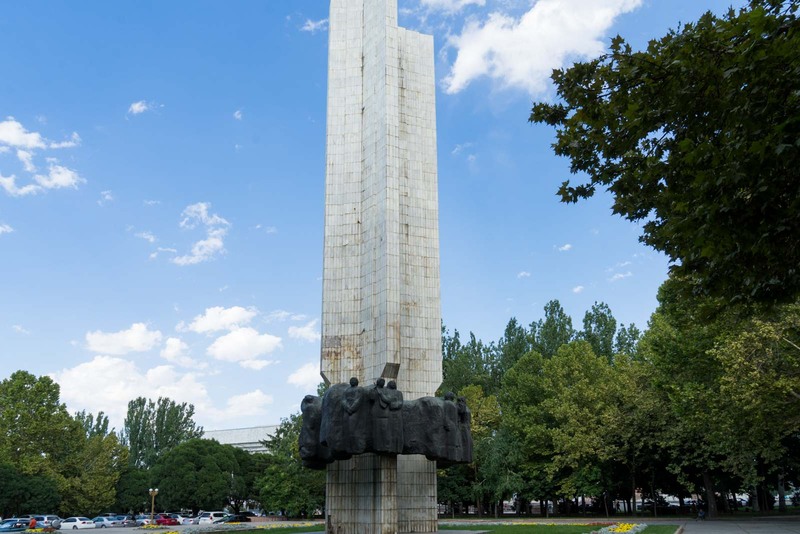 The People’s Friendship Monument was erected in 1974 to celebrate the 100th anniversary of Kyrgyzstan becoming a part of Russia. It’s an enormous sculpture – about 28 metres high – with 13 reliefs around it symbolising the connection between the two countries. It’s one of the more impressive monuments from this era that you can still see. 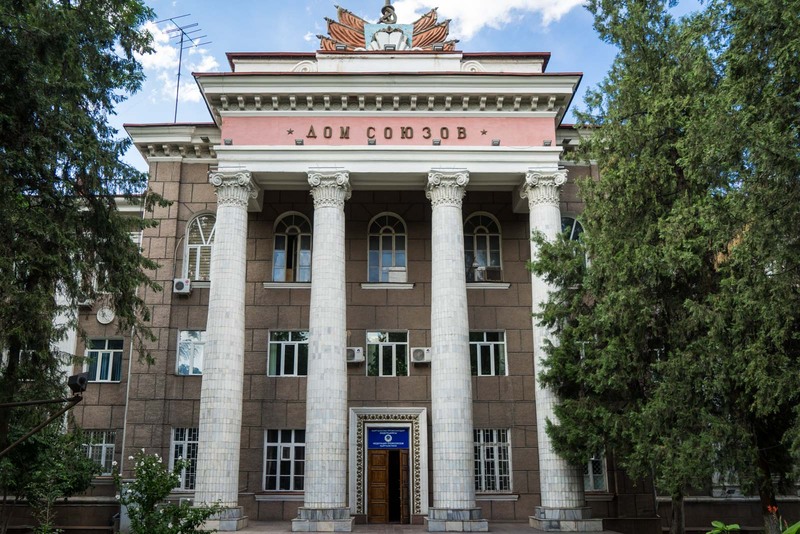 Here in Kyrgyzstan, the office of the country’s president is also called the White House, just like the US – although the President doesn’t live in this one. 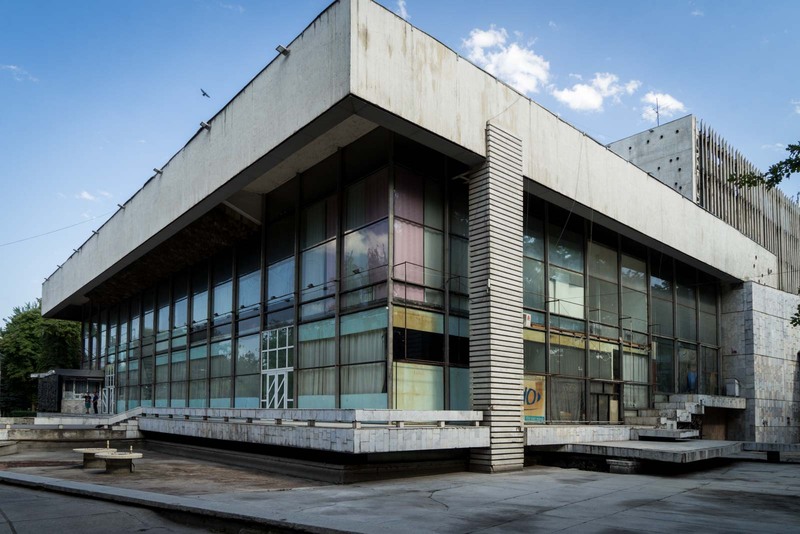 It was built in 1985 to be the headquarters of the Soviet Union’s Communist Party’s Central Committee. You can’t get close to the building and can only look at it through the fence. This is partly because security was beefed up after enormous riots in 2005 and 2010. The final stop of this walking tour is the Sports Palace (a rather fancy name for a leisure centre). It was built in 1974 and you’ll realise it has quite a similar design to other buildings from that year that you’ve already seen. Of particular note is the statue out the front, which was erected after independence in 2004. It’s of a legendary warrior called Kojomkul who was more than two metres tall and was an excellent sportsman. I hope you’ve found this tour useful. I wasn’t sure what to expect from Bishkek but enjoyed my time in the city. Although I still consider it to be a launching pad for adventures in other parts of the country, there is enough to do here and in the surrounding area to warrant a stop. I have heard about this city from many art and history lovers, They told me that this city is very rich in beautiful architectural buildings. Thanks for this amazing article, glad to read more about this city.